Welcome to the Male Pagan Webring! This is a very new webring. While browsing the web, after I got my site in place, I noticed that there really weren't any webrings for men and Pagan Spirituality. I told my wife about it and she said jokingly "Maybe there aren't any Pagan spiritual men!" This site is not necessarily for men only. Women are most welcome to join! This web ring is merely a way for Pagan men to link together and Pagan women to show their support. 3. Pages cannot have links to obsene, violent, or offensive links. 4. This isn't a requirement, so much as a stance that you agree to take when joining the ring. By joining the ring, you agree to uphold the belief that violence against women and children is UNACCEPTABLE in any way, shape, or form. There are far too many women and children in this world that are being abused by fathers, spouses, and male relatives. It's time that we let those men know that IT ISN'T RIGHT! As men, we agree that violence to ANYONE is cowardly and weak and in no way a symbol of masculinity! OK. Now you are ready for step two. Copy this html fragment onto your page and download the image. Make sure you put this image on your own server. Please don't link it to mine. "Right-mouse click" on the image and "save as". My computer is overworked and underappreciated to begin with. I don't want to add insult to injury. Make sure that you change the generic information (site ID, email address, and name) to your own. You will receive your site ID# after you fill out the form and submit yourself to the ring. This <a href="http://members.tripod.com/~theGreen_Man/webring.html"> Male Pagan Webring</a> site is owned by<a href=mailto"Your Email Address"><FONT SIZE="2">Your Name</FONT></a>. Alright! Doing good so far! Now, step three...fill out this form! Be sure to be complete and make sure your information is correct. If it isn't, I can't view your page! Remember to hit the "back" button on the browser for final instructions! Wow! You're in the home stretch! The last thing you need to do is email my wife (the Webmistress). My wife recently receive a rather sarcastic and rude email stating that I was a "poor overworked male" and that lumping the responsibility of this webring on her was not very understanding of the plight of women. Just in case anyone else feels that way, I've added this note. My wife runs this webring because she WANTS to. She runs it because she is better at this than me. She runs this because she is a professional webpage designer and it's second nature to her. We are one soul and where one is lacking in skill, the other willingly assists. This webring was my idea. I make the final decisions on who gets in and who doesn't. I keep abreast of all that transpires and my wife makes no changes to it unless I request it or approve of it. All she does is accepts the email requests and hits the "add" or "delete" button for me. With all that out of the way, do you still want to join? OK, email my wife at the following address and put "Webring Addition" in the subject. If you have any problems, please email either one of us! 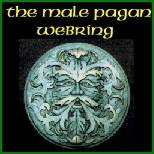 Thank you for joining The Male Pagan Webring!